With summer around the corner now is the perfect time to start investing in some statement pieces that will get you through the season. 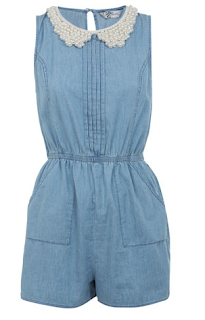 One of the key trends..denim! 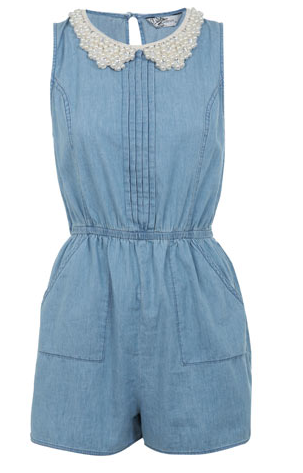 I love denim, there is nothing better than a cute floral dress with a little denim jacket or waistcoat. 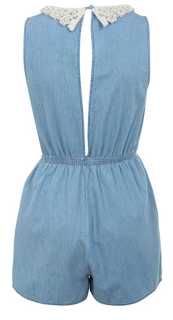 One particular piece that has caught my eye is this little denim playsuit complete with pearl peter pan collar from Miss Selfridge. The open back and the ruching at the waist give make this the perfect go to 'girl next door' summer outfit. I think this would look great with a pair of sandals and a tan satchel. Whats your top denim picks this summer?